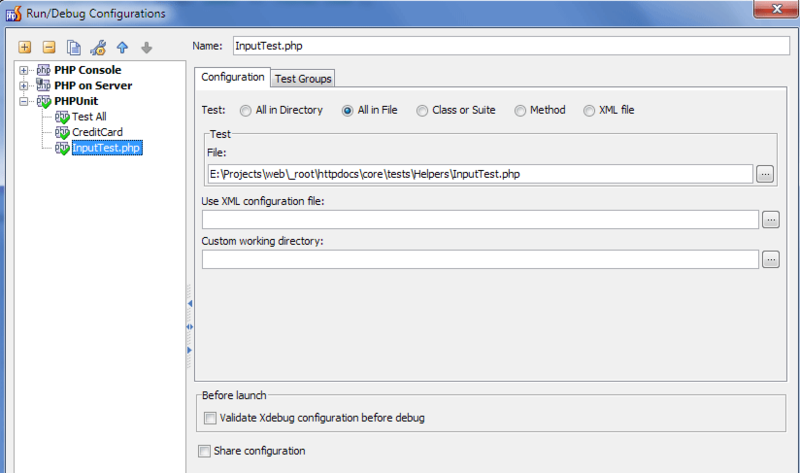 I've also tried without success to get phpstorm to generate a test class for me. There I get an error "Failed to execute PHP script. Please check your PHPUnit configuration". Below is a screen shot of my php config. My directories ONLY include my project, the help referred to adding PEAR to it, I tried that and didn't seem to make a difference. I know is probably something stupid, but those things are easy to fix, right? I will not be able to help you with the 2nd issue ("get phpstorm to generate a test class for me" -- I've used this feature only once, in v1 and it worked ok -- not perfect but ok) but will attempt with the first one. First of all (which may solve the issue for you straight away): what the filename of the test file? I'm not really using tests ATM, but when I was trying to do them (with success in the end) I had similar issue ("no tests were found"). To solve this -- you have to name your file with word "Test" in it. For example: SimpleTest.php, ComplexTest.php. 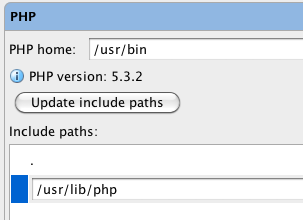 Did you add '/usr/lib/php' entry manually, or it came from php.ini when you clicked 'Update incude paths'? Which version of PHPUnit are you using? The name of the file matches the actual class - StackTest.php. I'm a java person mostly so that habit is hard to break. Thanks for any info you can throw my way. Sorry for delay with my response. I'm using Windows 7, so the paths and locations are different from MacOS, but I'm sure you will get the idea what and where you need to check based on my details and screenshots. My PHPUnit version is 3.4.15 -- so it should work in the same way as your 3.4.8. There are (or were) some issues with v3.5 of PHPUnit in PhpStorm build 98.21, like these: http://youtrack.jetbrains.net/issue/WI-3198?projectKey=WI&query=phpunit, http://youtrack.jetbrains.net/issue/WI-3326?projectKey=WI&query=phpunit. Just make sure that the 3.4.x branch is used during tests if you have more than one version of PHPUnit installed. My PHP is installed in "E:\Projects\php". PEAR folder is located inside PHP folder: "E:\Projects\php\PEAR". PHPUnit, accordingly, is located in "E:\Projects\php\PEAR\PHPUnit". That's my test project: classes are located in "Core2" folder, and tests (only 2) in "tests" folder (actually in "tests\Helpers" .. but that makes no difference -- this just to have the same folders structure as in classes folder). 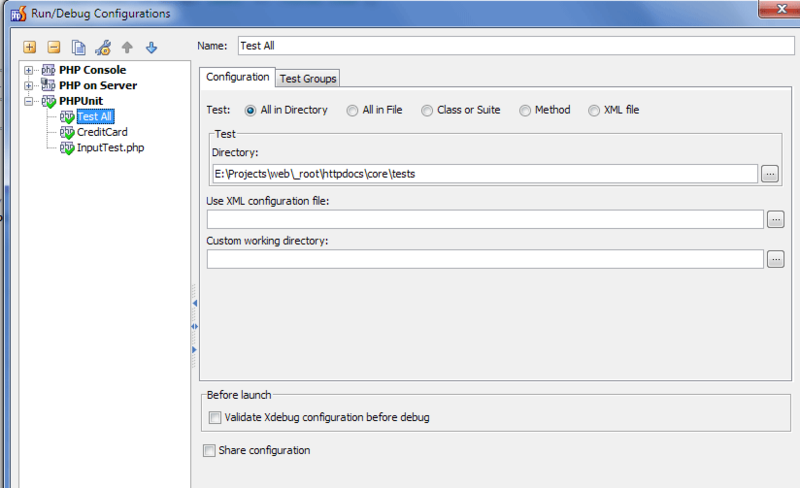 This is my Run/Debug Configuration for all tests (will run all tests available). 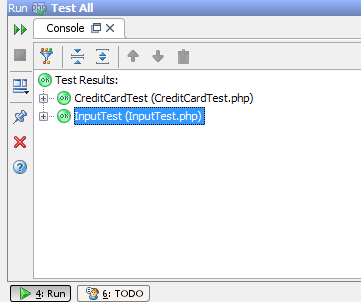 The tests will be run locally (console/terminal). The same but for individual test -- as you can see nothing major here -- just a folder or file to test (everything else was left on defaults). Run Results: all tests in 2 test files were run successfully (I've made only 2 test files for 2 classes.. did not really bother with the rest). Results of running PHPUnit manually in console/terminal. If it will not run then there are some issues with your PHPUnit installation or PHP configuration .. or even with test file itself (I don't know -- maybe try to remove BOM signature from StackTest.php if it present .. but if that would be the case then I would see some 3-character gibberish just before "PHPUnit 3.4.15 by Sebastian Bergmann." text in output). I hope this will make any sense to you and will help you in any way (that's in case if you have not resolved this issue already). Message was edited by: Andriy Bazanov; Reason -- corrected some typos. Can you try run the tests with default command line runner or any other tool? Sorry meant to post back to this yesterday, busy day. Of course I'd still appreciate any clues anyone might have. Found the culprit... inclued.so extension was causing the problem in my php.ini. I reverted back to the original osx php.ini and things worked, so I went back to the problem version of php.ini, removed one thing at a time and inclued extension was the winner! PHP and PHPUnit now behaves quite nicely.